Easily grow meaty, delicious shiitakes with Howard Berk and Todd Pittards organic mushroom growing logs. Shiitakes' meaty texture and earthy, smoky flavor has made them one of the most highly prized edible fungi. You'll love growing your own with Howard Berk and Todd Pittard's mushroom growing log. The duo salvage recently felled oak and sweetgum trees, cut them into logs, and plant organic shiitake spores inside. All that's left to do is soak your log and keep it in a damp, cool, dark place. Soon: fresh shiitake heaven. Re-soak and harvest every six weeks or so for up to three years. That's a lot of shrooms for stir-fries, stuffings, salads, and sauces. Put a smile on the face of your favorite mushroom lover, gardener, or mad scientist. Handmade in Georgia. Howard Berk and Todd Pittard’s fungi love started years before they knew each other. It was certainly fated that they’d meet at the local farmer’s market, bond over their mutual passion, and start a shiitake and oyster mushroom company. The twosome salvage healthy, fresh-cut Sweetgum and Oak trees that are on their way to the chipper, and take the logs back to their Chamblee, Georgia shop. Once inoculated with organic mycelium, they’re aged on the farm, to help the fungus develop. Howard and Todd put a lot of love into each log, and the wood gives it back, producing premium, healthy, delicious mushrooms for two or three years. 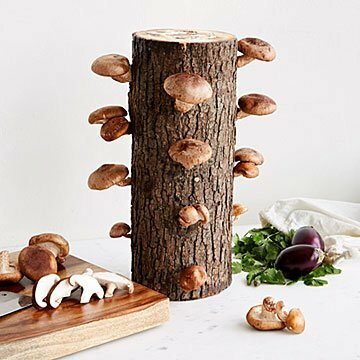 The duo sell them to local restaurants and the lucky public, and now, you can get their inoculated logs and start your own own mushroom garden. They hope you enjoy the fruits of their labor. Click here for mushroom growing instructions & tips. This was a Christmas gift for my brother who has grown his own mushrooms before but not this variety. He was so excited to grow them but it never propagated. Include more instruction with packing, such as refrigeration, covering with plastic and misting. I will use it to grow my own mushrooms from my house. Packaged well, and looking forward to seeing them grow. A unique, uncommon good-true to the website name! This was a gift to my daughter for Christmas, so she hasn't had a chance to reap the rewards just yet. She couldn't believe her eyes when she opened the wrapping paper! This was a truly wonderful find! Thank you for such a unique gift! I love the low profile! We will definitely update this as we get results. We have to wait for the mushrooms to grow. Our granddaughter was very pleased to have something that is totally usable. She can't wait to see the little sprouts. This was the perfect gift for the person on my list who is difficult to buy for. He loved it and I kind of wish I had got one for myself. I got this as a birthday present for my father who is hard to shop for. It was perfect because it is unique, fun, and useful! He was very surprised and excited when he opened it and is looking forward to getting started. My dad loves to garden and cook with fresh food. He can't wait until he gets his first crop. I have had nothing but good experiences with Uncommon Goods. This product seems cool...I do hope it really grows mushrooms! It's been like pulling teeth to get instructions on what to do with it. It seems like it was hastily packed...it came with a piece of paper that said 'click here for instructions'. Since you can't click on a hyper link from a piece of paper I've had to chase down instructions. That has been fairly painful.